There’s always time for nine! Get your weekly golf fix at this new summer golf league. It’s a quick 9 holes with fun and prizes. Teams of 4 tee off at 6:00 pm every Tuesday and Friday night through October 31. 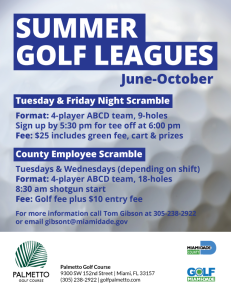 A new summer golf league for County Police, Fire, Transit, Water & Sewer, or any other employees who work shifts outside the typical “9 to 5”. Beat the heat… this golf league tees off at 8:30 am. The schedule is flexible, with 4-player team scrambles every Tuesday and Wednesday morning through October 29. Tee times are available up to 7 days in advance and may be booked online or by calling (855) GOLF-305. Single-rider golf carts are available for persons with disabilities. (Please call the golf course and allow 24-hours notice when requesting a single-rider cart.) Call 305-755-7848 (v/tdd) to request materials in accessible format, a sign language interpreter (five days required), and for information on access for persons with disabilities.